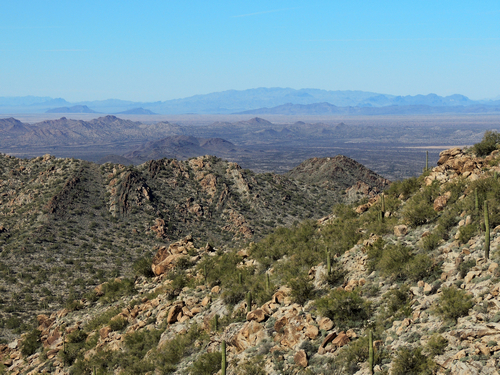 Very enjoyable trail from Vicksburg to Salome through the Granite Wash Mountains and the Harcuvar Mountains. Nice scenery and some unusual attractions. This trail can be run either way equally well, but we started in Vicksburg. 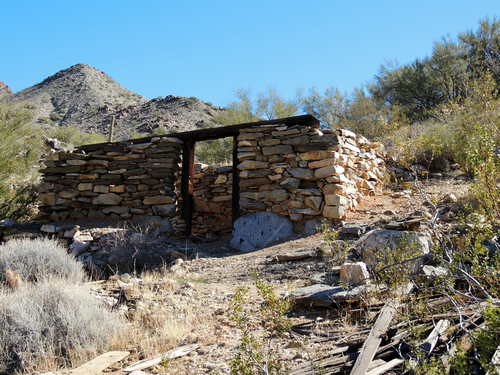 Started out crossing the southern tip of the Granite Wash Mountains and passed by numerous old mines. Dropped out of the mountains and followed north along the eastern face of them. 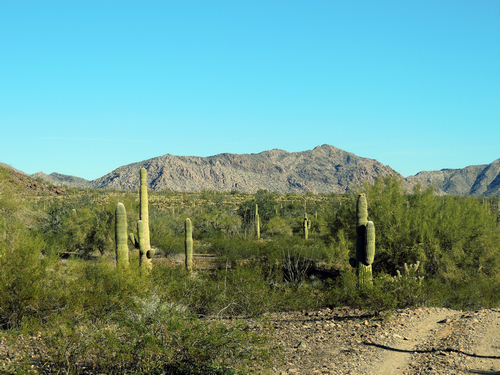 Nice stands of saguaro. 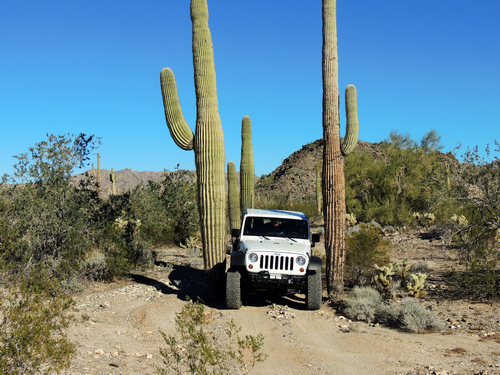 The "Saguaro Squeeze" suggests to us that this portion of the trail was never constructed as a road - someone simply started driving across the desert. Salome Prison Part way up this leg of the trip we turned west on a spur to the base of the mountains. The Salome Prison is at the end of this spur. It appears this began with a natural hole under a huge rock. 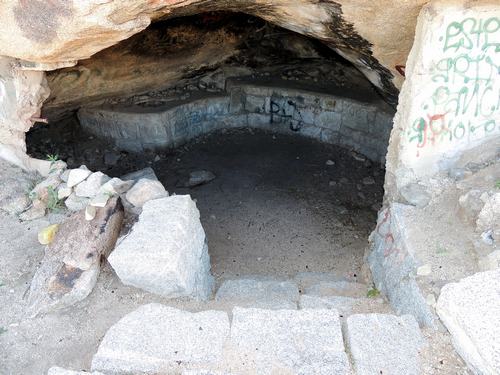 There is a granite bench inside the hole, granite steps leading down into it and the front has been walled up. A few years ago there were still large eye bolts in the bench that were used to chain prisoners. They have been vandalized. At this point there are two stories. Perhaps neither one is right. 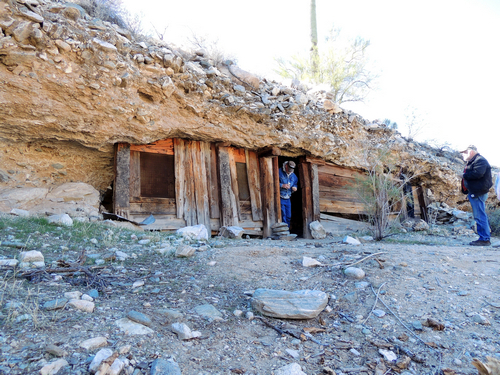 This was a stopover when transferring prisoners to the Territorial Prison in Yuma. Prisoners were chained up for the night and the journey continued in the morning. 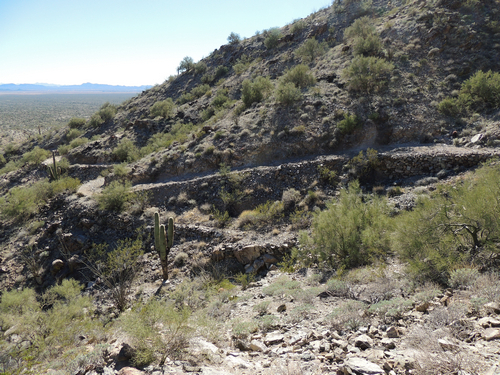 There is a trail to the right leading to 'Indian Spring". My maps do not show a spring, and there was no water when we were there. 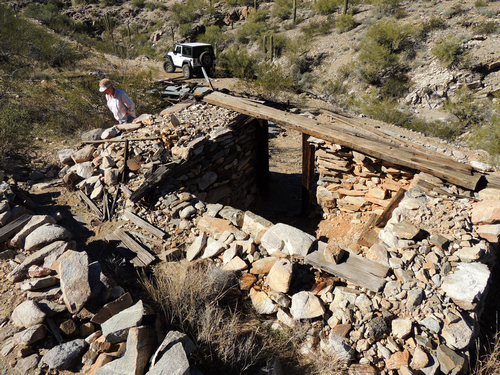 Prisoners were used to quarry granite for either the Yuma Courthouse or the West Wing of Arizona's Capitol. 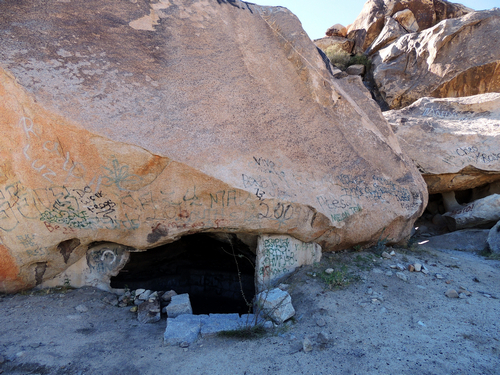 Follow the tail to the left and you will find remnants of blocks cut from large granite boulders. There are also large anchor bolts that probably helped when moving the boulders and cut stone. Tank Pass is a short distance to the north. 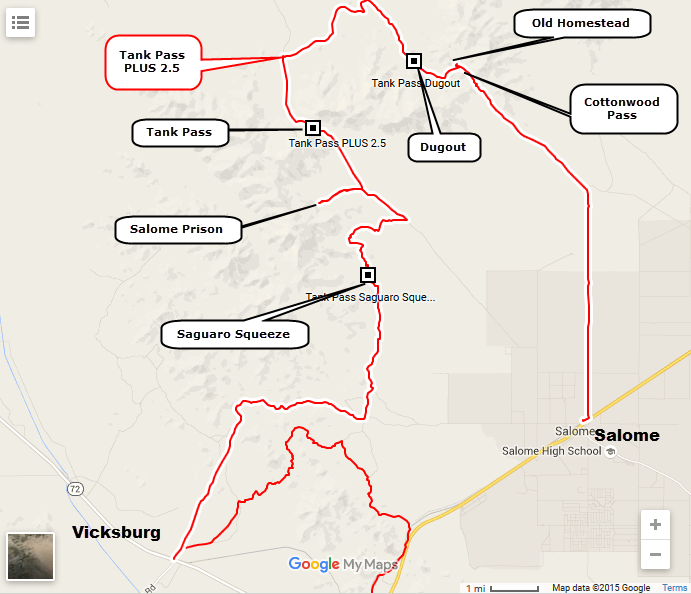 General Patton trained with his tanks in this area and the pass is named for this. His camp was in the flat country to the north, but this trail does not go to the location. Dugout As you climb into the Harcuvar Mountains, use the waypoint in this gpx file to visit a "Dugout" in the side of a wash. This dugout has 3 rooms and a fireplace. Old Homestead Take a spur on the left to visit what appears to be an old homestead. 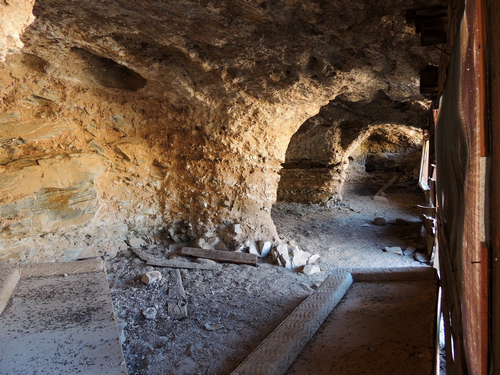 There is a residual cellar that might have been used for storage out of the heat. There are a number of short walls in various locations that might have been foundations for buildings. Cottonwood Pass is a short distance after you return to the main trail. This trail crosses two passes - Tank Pass and Cottonwood Pass.